4/30/2009 – "Using the FIDE Laws of Chess terminology, the move has been made, and no takeback is any longer possible." 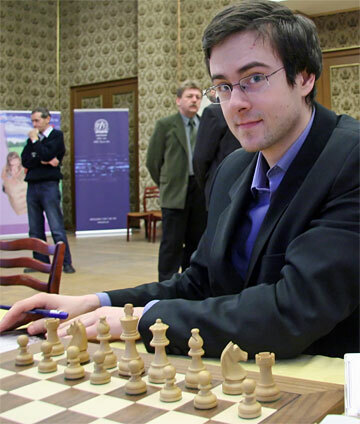 Polish GM Bartlomiej Macieja is insisting that the decision to increase the K-factor in rating calculations is not just necessary and good in the current tournament situation, it is in fact irrevocable and can only be legally changed by the body that passed it. Open letter. Thank you very much for your immediate answer. I am fully aware that the Presidential Board is sometimes entitled not only to delay implementation, but even to take important decisions. I find it very reasonable, especially if they are controversial and they were not tabled in advance, thus came as a surprise for delegates. The same regards proposals which might have financial implications. I am also aware that sometimes the General Assembly cannot come to a common conclusion and gives the Presidential Board the right to decide. It is also a reasonable step, as it is much easier to discuss complicated problems in a smaller and better prepared group. For instance, during the General Assembly 2008, Mr Makropoulos proposed to postpone a decision regarding the problem of coming late for a game for the Presidential Board meeting. Nobody objected, his proposal was accepted. The case of the K-factor is, however, completely different. It was widely discussed during the FIDE Congress 2008, first at the Titles and Ratings Committee meeting, then at the Qualification Commission meeting, eventually the proposal of change was approved by the General Assembly, with no single voice of objection (including no single voice of objection of any member of the Presidential Board). It means, that contrary to the problem of coming late for a game, the General Assembly decided to take the decision and not to postpone it for the Presidential Board meeting. As so and as the General Assembly is the highest authority of FIDE, the decision has to be followed now and only further General Assemblies are entitled to change it. Well, I am even not mentioning that the recent FIDE announcement was not a conclusion of the Presidential Board meeting, but a result of "the ten-day working visit of Deputy President Georgios Makropoulos in Singapore with General Secretary Ignatius Leong". It is clearly not sufficient to challenge decisions taken by the General Assembly. As I was present during the General Assembly 2008, I would like to stress, that contrary to the information included in your letter, the change of the value of the K-factor was not only written in a report of the Qualification Commission, but also orally announced by the chairman Mr Mikko Markkula. The chairman even added that he had made "all the calculations", they were on his computer, and everybody wishing so could see them at any moment. Thus, even all sugestions that the delegates could not be aware what they were accepting are baseless. Concluding, using the FIDE Laws of Chess terminology, the move (the decision) has been made and no claim or takeback is any longer possible. I fully agree that players should be much better informed about the reasons standing behind the increase of the K-factor. The main concept is that the higher frequency of publishing rating lists reduces the effective value of the K-factor, thus the value of the K-factor needs to be increased in order not to make significant changes in the whole rating system. With one rating list published yearly, as originally done by professor Elo, the K-factor equal 10 played its role. With six rating lists published yearly, the value of the K-factor needs to be increased. With the frequency of one rating list published every two years, the value of the K-factor would need to be decreased. I have already done the job of publishing two articles on the ACP Website regarding the topic. They were also published on other commonly visited websites, so chess players could get known about the change and understand that it was not a political decision, but a statistical necessity. I sincerely hope FIDE can also join the efforts. Five months have already passed since the FIDE Congress in Dresden, fortunately two more months are still left before the 1st of July. As you have correctly mentioned, ratings play a very important role nowadays. Based on them players are directly nominated for major FIDE events, also for national championships, they are invited (or not) for various tournaments with different conditions. And that is exactly why it is so important to have a proper rating system. This time, after a week of work, FIDE has clearly made the right move.